100 West grants artists and writers residencies to create work in a historic, decommissioned Odd Fellows Lodge repurposed for studio space. Large-scale, light-filled rooms are provided alongside complete living accommodations and woodshop access to produce work in two or three dimensions, installation, or writing. This residency experience is enriched by artist-made furniture and antiques in a building virtually unaltered since the 1890s. 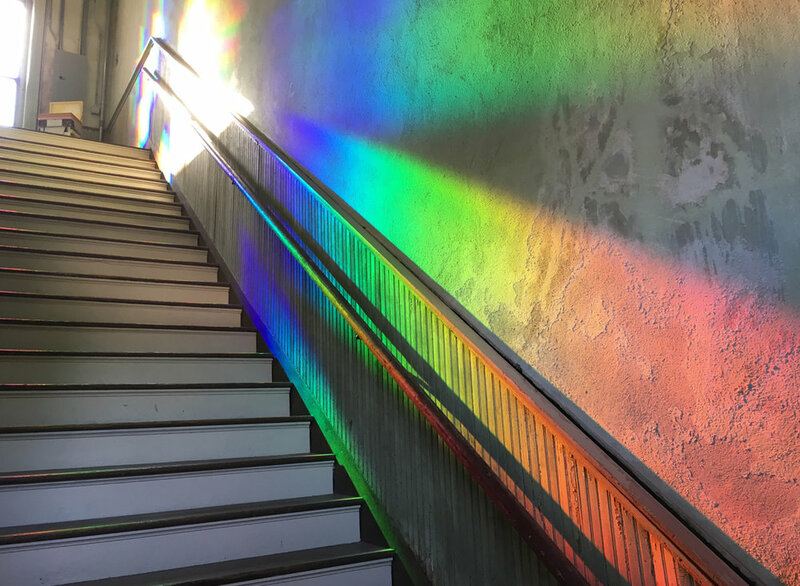 Original mill work, light fixtures, painted doors and walls, now cracked and worn remain amid six years of preservation work, effectively contrast contemporary modes of art-making. 100W maintains a close connection with Dallas culture fifty miles from downtown Corsicana, where the backdrop of nineteenth century oil boom vestiges, now faded, are quintessential Texas. 100W is hosted and furnished by Texas-based artists and writers, for artists and writers from a national and international scope. Who is behind the gallery and who runs the different aspects of the operations? The residency program is co-founded and directed by Kyle Hobratschk, with core support from co-founder Travis LaMothe, Adrienne Lichliter, Anna Membrino, Nancy Rebal, and David Searcy—artists and writers who realize 100 West’s mission with resident recreation, programming, administration, and admissions. Can you tell us more about how and why you decided to start the residency? What was the impetus to take the plunge? How did you find the space and decide on the location? KH Maybe it’s kismet. I’d never heard of Corsicana before meeting the artist Nancy Rebal in a printmaking course I was teaching in Dallas. She learned I was seeking space to outfit a woodshop for creating furniture, and cast the idea about this building her friend Karan Verma was selling fifty miles south of Dallas, in the half-vacant downtown of Corsicana. Texas’ first oil boom was witnessed here in 1894, and through a succession of booms and busts, holds a population of about 20,000. I made my first visit with friend and painter Anna Membrino, and that hour-long drive felt like a barricade against any sensible notion for a studio. But we were caught by the scale of the place, its almost entirely intact 1890s interiors, and the possibility of workspace between three floors of 11,000 square feet. We were also too naïve about what degree of restoration was necessary to re-inhabit the building. It’s a red brick, Territorial approach to an Italianate style, with cast stone ornament sprouting around tin cornices. 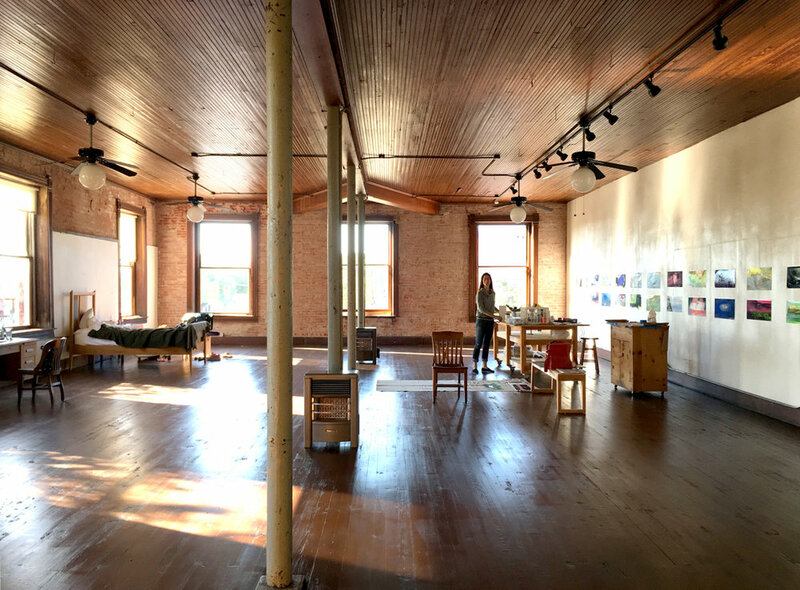 (Karan was widowed to the late Texas artist Doug MacWithey, who took the first stab at restoring this neglected Odd Fellows Lodge for his vast studio five years earlier). The whole structure was moist, with maybe thirteen-odd pails spread to catch rainwater. Following two weeks of repeat trips to tour the lodge with a handful of artists, I purchased the property with spoken agreement from these friends who committed their time and sweat to help restore the air-conditioningless building in exchange for sprawling studio space.Those drives back and forth from Dallas continued to feel shorter as we planned along the way. Travis LaMothe and Kiernan Lofland plunged with me from the start to establish a woodshop on the first floor, which despite intentions, became less exercised for our envisioned sculpture and conceptual furniture practices, and more for building improvements like window frames, bathrooms and built-ins. The first investment aside from a new roof was a thirty-year-old Altendorf table saw, which continues to rip more trim molding than stretcher frames. We’re sculptors and painters, tackling this building as if it’s on a pedestal or easel in our studios. It was always: we need to make a work table to make a work table—pinning ourselves to the construction of most essentials like tables, chairs, bed frames, wood racks, and silverware drawer dividers instead of buying pieces that felt too easy, and maybe therefore ethically and visually inconsistent with the origin of a work space. For those initial few years since April 2012, a small band of artists based in Dallas were commuting to Corsicana to forget cramped space and urban noise, and re-established studio practices with the patient understanding that making work leveled with preparing space. Artist Nancy Rebal and writer David Searcy rented the third floor studio, while artists like Randell Morgan and Casey Stallings set up shop on the second floor. A shift occurred in 2015, when we recognized that the fifty-mile distance from Dallas was in fact a barrier against developing long-term, consistent studio routines for Dallas-based artists with even part-time jobs. And that it made more sense to travel from farther distances, and stay ensconced in Corsicana for concentrated periods of time, like one to three months. The building became increasingly available as some founding friends moved across state and country lines, though Nancy and David dove deeper and purchased their own studio building across the street from 100w. Travis and I branded the residency, mitigated functional challenges between private and communal space, and built a website with an application process to enroll the first year of residents in January 2016. We were regarding the creation of workspace primary, while our own works within became secondary—reassuring that utility in our own practices by offering these rooms to unfamiliar artists and writers. What are some of the unique and positive, as well as challenging aspects of the location? KH The challenge of distance from an urban center like Dallas has also become the draw. It’s not uncommon to pick up a resident from the airport and hit an art supply shop in Dallas before venturing to Corsicana, where then, generally without a car, a resident stays focused to the bricked streets of the small historic downtown by foot and bicycle. Ma and Pa hardware shops, diners, tailors and grocery stores are all in visible distance from the residency building. As is a spectrum of small town oddities, signage and layering of styles not always evident or even existent in developed American metropolises. And save for the freight train several blocks away, this place has a quietness that’s conducive to fresh work. And the warmest, most receptive population of locals who invite our residents to dinner in the most curious, century-old, oil boom neighborhoods. The building’s studios have a massive scale, and are full of 9-foot windows that remain open through spring and fall. We have gas heaters, but no air-conditioning. Summer’s a beast down here, so we call for a hiatus June through September. TL For both unique and positive, the interior spaces—shop included—all remain rarely intimate in their large scale. The studios are arranged in a way that each resident is offered a wealth of private space, and common areas work to centralize conversation. You can never be close enough to an airport, and we’re lucky to be between Dallas and Houston. It becomes an important challenge to mediate, acknowledging those cities as great hubs for art while working to create the same in Corsicana. What were some of the biggest challenges involved in starting and converting the space? TL The obvious challenge, faced with a structural backdrop from 1898, is the physical upkeep. It took a bit of tidying to bring the comfort back. KH A bit? I’d say so. Though we’re hesitant to do too much and sacrifice the atmosphere that begged us here. You could go overboard. Fresh finishes and fixtures throughout, and then it’d be like most any other restored, old building. We’re more about preservation. The original coat of celery green colored paint remains in the stairwells and on molding, and can flake with a strong cross breeze, though we expect crisp, white walls in the studios. The kitchen and bathrooms required good attention; they need to be hygienic, though we love the existing 1930s cabinets. As long as the place is waterproof, structurally sound, and clean, we’re good. There’s a lot of caulking. Maintenance is endless, but has become a welcomed element in our artist practices. And then there’s furnishing. Nancy and David just gifted an Art-Deco piano to the building for our five-year anniversary. It’s alongside a turn-of-the-century, large, French baker’s display table that we use for our everyday dining. We light oil lamps at night and sit on Depression-era school chairs purchased from a shop downtown. Travis’ created these red phenolic, CNC cut and assembled chairs, maybe ten in total, elegantly functional (one each at the heads of the dining table), and they’re placed throughout the studios, and vibrate perfectly against moments of peeling green paint. Everyone sleeps on extra-long twin mattresses (manufactured here in Corsicana), elevated on oak bed frames I constructed in the downstairs woodshop. They’re simple and austere, and call for a kind of monastic lifestyle. Above all, we don’t decorate. The building’s exterior ornament is enough. The place is kept minimal so that the work is focused. TL The rest is listening to residents. Part of the goal is learning what hospitality looks like when it’s housing not just a life, but a practice. KH We plan to design and build more studio furniture that problem-solves some recurring practices we’ve observed. Like a system of trays and boxes for residents’ supplies. And media-specific desks. How do your unique skills or perspectives as artists contribute to making the residency and programming a reality? TL First participating in this place as artists ourselves helped, before we invited new faces. It became clear, early on, that the program should retain a mix of artists and writers. We have different views on what kinds of content, action, and events ought to happen in both the program and the building. Each involves thinking ahead and mixing residents who might need the space with residents the space might need. KH Exactly, the tone for the place was set with our initial, founding crew. We developed these studios for ourselves, as sculptors, furniture makers, painters, designers and so on. Then sought residents who seemed fitting for this envelope. Though with each passing round of residents, the tone adjusts and expands. David Searcy first demonstrated how valuable writers are to a residency community comprised mainly of artists. We also like community, and that part blends with public programming, so it becomes honest and natural. Adrienne Lichliter cooks for most every event, and coordinates specific programming with resident work. Like a chili cook-off to compliment featured resident work about local cowboys. Can you tell us more about your mission? What type of work are you interested in showing? What kinds of artists are you interesting in supporting? TL This is a great question. The important thing we try to remember is that we’re not a school, an exhibition, a publication, or an award. We can offer a specific place for a specific time, so it’s easiest to ask instead, “who is that for?” It’s exciting to see artists and writers open their practice in ways specific to this program (if only selfishly to prove that it works, in some way). So in short, we want to show work and support artists who are eager to explore, shift scale, and chase new ideas. KH We’re also interested in artists and writers who may have some curiosity about Texas and the mystique of this post-oil-boom town, though that’s not imperative. We talk often about space being material, so we try to identify artists who can justify three thousand square feet in most any medium. Though once we hosted a writer, and his desk/chair unit was the only furniture in the middle of a window-wrapped studio. We felt he needed that wide margin for pacing. Marcelyn McNeil, Sarah Boyts Yoder, and Eric Diehl come to mind as artists who needed the second floor studio’s sixty-foot-wide wall for large-scale painting. Or Adam Raymont and Michelle Mackey, who worked on a smaller scale, but serially, amassed whole walls worth of work. Gavin Morrison came to research historic, founding ties to the Isle of Corsica. And resident Noel Camardo has returned at least a dozen times from nyc to photograph so many contemporary realities of small town, Middle America. We’ve been lucky to receive a good number of repeat residents. They know better what they’re getting into, and we’re better positioned to support their work. It’s also fascinating to witness work develop by residents who may be in the United States for their first time, as well as an artist coming from as close as Dallas or Houston who’s reevaluating his or her conception of this state once given the space and time. What are some the short term goals for the residency? TL We’ve been really lucky with what goes in, like the residents themselves, and I think are ready to focus on what comes out. We’re lucky to have shared meals, exhibitions, readings, and screenings with guests and residents, but that side of things can always be ramped up. Does the program need a yearbook? A store? A project space? No promises in either court, but that’s the kind of expansion we’re looking at now. KH More will be possible as our non-profit dedicated to supporting 100W artists and writers develops this year. What have been some of the most interesting programming that you’ve coordinated at the space so far? KH We love hosting dinner parties. But one reigns above them all: Southern Intentions. This event was collaborated by printmaker Adrienne Lichliter, ceramicist Brent Pafford, and chef Lindsey Byrd. Twenty guests were invited to the third floor where a long table was set with porcelain plates, bowls and cups, all created by Brent, specifically for a menu developed by Byrd. Fried chicken was the feature, served in Brent’s oblong porcelain bowls, which mimicked the shape of those ubiquitous, red plastic baskets, and lined with brown paper, as Southern tradition holds. Following the meal, each guest took home their set of dishes, and found in the mail two months later a multi-plate lithograph by Adrienne, created from a process using the grease marks, fingerprints, and splatters left on the brown paper. Another event featured the work of a local outsider artist we came to befriend, Wayne Hall. He makes work from the discarded objects and trash of everyday life. He likes to use armadillo shields found on his property, iridescent spray paint, and dry macaroni. Our resident Noel Camardo returned to Texas to take photographs of Wayne at his home, which were featured alongside a gorgeous essay by David Searcy, published in the Oxford American Magazine in March 2017. David, Nancy and I framed and mounted sixty or so works of Wayne’s in our woodshop, for public exhibition in our studio spaces. TL Just recently we held a film night, anchored by an award-winning feature film produced by a former resident from Los Angeles, Pete Ohs. We outfitted the third floor with a projector and loads of seating, and screened film work from multiple residents for the evening. It offered a new example of the types of showcases we can do in the future, and the dialogue it sparked was lengthy. Can you talk a bit about balancing your role as a working artist with the daily operations of running the residency? KH There’s little balance. I’ve come to peace with the fact that these past several years, and maybe the next one or two, are more devoted to managing a growing residency and maintaining a building than my own personal practice—though these routes have crossed concurrently while making furniture for the building. Once 100w and the non-profit develop to include a hired administrator and director, the door to downstairs’ woodshop will open wider for projects outside of commission work. TL I’m always asking myself how to separate my gut as an artist with the skills needed to curate and administrate the program. On one hand, you can’t see the other spaces and projects as outcroppings of your own practice on a large scale. It’s not meant to be a child born of your own eye, but evaluative decisions still come from that place. It’s important to let the project become part of our practices, and not the other way around. What are some of the important aspects of artist-run spaces and projects today? KH There’s a certain sensitivity that an artist-as-host nurtures in an artist-run project, that perhaps a non-artist-as-host may be more challenged to find. Though sometimes we get too in our heads, and need non-artists to smack reality. I think successful projects have a blend of both. What are some of the most rewarding aspects of running the residency? TL It has to be the people. The residents are the variable, and the most rewarding one. We’ve been lucky to meet a wealth of guests who are heavily invested in advancing their work. Seeing that in action never gets old, and it becomes important to keep that awareness close. We’re motivated by their engagement. What are some of the unique opportunities offered to emerging artists through your organization? KH 100W is primarily unique in its Texas atmosphere inside and outside. Space and sky are larger here. We have intimate community while maintaining private studios. Two artists and one writer at any given time. A combination of emerging and established creators, with access to a woodshop and printing press. We love introducing our residents to Texas-based curators, gallerists and publishers, which is so possible and natural because this place remains deeply personal. We’re not shuffling large numbers of artists and writers through halls and halls of studios. TL This changes for each artist and writer, so remaining accommodating is important. Ultimately, we want everyone to feel this experience is helpful for a career. For some, that means unfettered time and space to change their studio environment—working in a larger space, having access to more tools, and sharing conversation with people from other parts of the world. For others, this means the opportunities that might come later—an exhibition in Dallas, a road trip through Marfa on the way out of Corsicana, or collaboration on a project down the road. How do you spread the word about the residency? TL We’re listed on residency databases. Press and word of mouth handle the rest. This is the area with limitless potential, and also why we’re looking to capitulate some of these experiences with a publication in the future. KH We also invite artists and writers who we suspect may find this place useful. Are there any interesting events or upcoming programming that we should keep an eye out for? KH Ed Eva was a resident in 2016, and is returning from Europe this spring with his collaborator George Baldwin. Their duo, EEGB, will be shipping human-sized robots they’ve created in Berlin to Corsicana, to be covered in faceplates and programmed at 100W to perform a system of rituals based on Odd Fellow ceremonies in the Third Floor Studio—which functioned originally as the Odd Fellows Encampment Hall. Ebrard Aymeric is also using the former Encampment Hall as studio for a project bridging carpet patterns back-dropped in Pasolini’s 120 Days of Sodom with Odd Fellow rituals. He’ll create eight, vertically installed panels painted with tempera binding pigment and dirt sourced around Corsicana. We’re pleased to partner with Scalawag Magazine, and their managing editor / our past resident poet Alysia Harris, to bring Masud Olufani to 100W in February. He’ll be involved with Corsicana’s Black community to develop new drawings, with an outdoor, public feature. Are there any other interesting artist-run projects in your area that we might be interested to know about? KH You must know about the Webb Gallery thirty-five miles west of us in Waxahachie, which exhibits outsider artwork and historic, fraternal arts objects. It’s the wildest collection. Bruce Lee and Julie are both Odd Fellows and have informed our program extensively about how this Lodge would have been used in it day. Several Odd Fellow objects installed in the building have also come from Bruce and Julie’s gallery. Across the street from 100W is a 2,400 square-foot building that one of our past residents from New York purchased for a project space, though he’s more interested in letting other’s play with it than himself. Rumor holds that our favorite Dallas-based publisher may open a bookshop in there soon, alongside available resident work. And while perhaps not artist-run, the historic Collin Street Bakery downtown has given Corsicana the reputation as the world’s Fruitcake Capitol. I hear that the Queen of England enjoys one every Christmas, and if you send mail to Fruitcake, Texas, it’ll show up in Corsicana. Though we’ve yet to try 100 West 3rd Avenue, Fruitcake, TX, 75110. Thanks so much for taking the time to talk with us! To find out more about 100 West Corsicana, check out the website.